The University of Oxford has a longstanding history in providing services to external academic and commercial institutions. We are happy to offer our expertise to external customers and provide access to electron beam lithography in the form of a service on a competitive pro rata basis. Electron-beam lithography does not require expensive mask sets, making our nano-scale resist patterning capabilities on commercial substrates particularly suitable to prototyping and small scale R&D activities. The JEOL 5500FS e-beam lithography system is located in the clean room situated in the Denys Wilkinson Building on Keble Road. Full details of the capabilities of the system can be found by clicking on the sub-menus on the bar to the left of the screen. If you are interested in using the system please contact Mr. Paul Pattinson, whose contact details are in the box on the right. 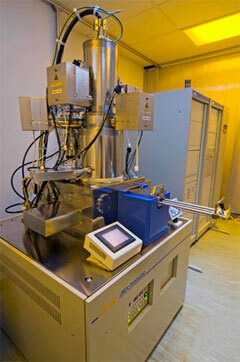 The Department of Physics also has a Raith e_LiNE electron beam lithography system located in the Clarendon Laboratory. This instrument is situated in a Class 100 clean room facility and is available for use by researchers requiring access to electron beam lithography.